Over this past winter I decided that 2012 would be the year of the Minam River. I have spent years learning the Wenaha River and Joseph Creek intimately and it is now the Minam River’s turn. I made an initial 4 day hike into the Minam several years ago and explored about 12 miles of river. Last year I made 3 fly fishing trips into the Minam River and hiked a whole lot of miles and covered a significant portion of the river that I had not seen during the first trip. These first 4 trips were all late summer though, towards the end of August and first of September. To know a river well, I like to fish all of it and throughout the seasons. After two hard hikes into Joseph Creek to get my legs and body ready for a longer backpacking trip, I planned a week long Eagle Cap Wilderness hike that would take me from Two Pan trailhead on the Lostine River, up to Minam Lake where the Minam River used to begin (before it was all diverted to the Lostine), and all the way down the Minam River to its confluence with the Wallowa River at Minam town. My initial plan was to combine a packrafting and flyfishing trip on the Minam River. I hoped to do this trip on the Minam in the 500 cfs range which would be a happy medium between good floating and good fishing (I was guessing). After studying the past 10 years of flow data and looking at our current snowpack (below average for the first half of winter) my best guess was that the Minam would drop into that 500 cfs range by early July. We, however, received a lot more precipitation as the winter progressed and soon our snowpack was at or above normal. I also did not plan soon enough and by the time I was making plans, everyone I knew who was capable of doing this trip could not go. I settled for a solo hiking trip and when I started my trip the Minam was still fluctuating between 1,300cfs and 1,600 cfs. Those are not ideal flows for fishing. I thought most of the snow was melted for the year and thought it might drop significantly while I was on the river. Besides, this was “research”. How did I know that the upper river was really not very fishable at those flows until I actually fished it? Discovering the good things about a river usually involves trial and error, probing and searching different parts of the canyon at different times of the year, learning what is good and more importantly why it is good. The why is often the harder part. I packed for an 8 day trip and somewhere between 50 and 60 miles of hiking (I hadn’t actually added it up, but the Minam is close to 50 miles long and I was starting on the Lostine). The weather could still be cold or rainy, especially up around 8,000 feet elevation, so I took a set of long johns for nighttime and took a lightweight rain coat as well. Molly was joining me for the hike and 8 days worth of dogfood was going to be an issue. I have always packed Molly’s food in my own pack because we are usually only going for 2-3 days. 8 days worth of food adds up for both Molly and I. My wife (Lottie) had bought a pack for Molly but I had never used it. Now with a heavy pack myself (I was carrying fly fishing gear including waders, pistol, DSLR with long lens and short lens and tripod, and more clothes than normal to prepare for weather) I did not want to add 8 days worth of dog food to my pack. I weighed Molly and then read on the back of the dogfood bag how much food she should eat per day. I then added a little extra and rationed out 8 days worth of dog food. It was much more than will fit into a dog’s pack, so I put the remaining into my own. I was still carrying the bulk as I could only get about 3 days worth of food in her little dogpack. I had purchased a book titled “Into the Minam: A History of a River and its People” a few weeks earlier and had not read it yet. What better time to read a book about the Minam then while you are hiking in it I thought. So I added a book to my pack, which I don’t typically do. With a heavy pack, Molly and I were ready. Lottie dropped us off at Two Pan trailhead and I was happy to see only two other vehicles at the trailhead even though it was a weekend. Molly and I set off from the trailhead at a good pace. The first 6 miles of the hike followed the Lostine River upstream to Minam Lake. It was a very nice, gradual hike but the torrential flows of the Lostine weren’t making me feel very optimistic about the flows for the Minam. I ran into some spots of snow after a few miles of hiking, but was more surprised when it became all snow. I had assumed that there would not be much snow left, but you know what happens when you assume things, but I was learning. I had never been up this trail before and according to the map it more or less followed the Lostine River to Minam Lake. Since I had no idea where the trail was after I got into the snow, I simply followed the Lostine River. I eventually found Minam Lake and was rather surprised to find it almost completely iced over still. When I started that morning I thought I might camp at Minam Lake and do a day hike up to Blue Lake, but with the lakes iced over and the snow covering the trails, I decided to head down the other side into the Minam drainage after eating some lunch and taking a few pictures. As I headed out from Minam Lake I found a trail sign in the middle of the snow and reviewed my map so I could head in the right general direction. I thought I was on the trail a few times, but soon completely lost all sign of it. The trail was supposed to switch back and forth a few times before coming down to the Minam River just below Blue Lake so I simply headed downhill through the most open paths until I came to the Minam River. 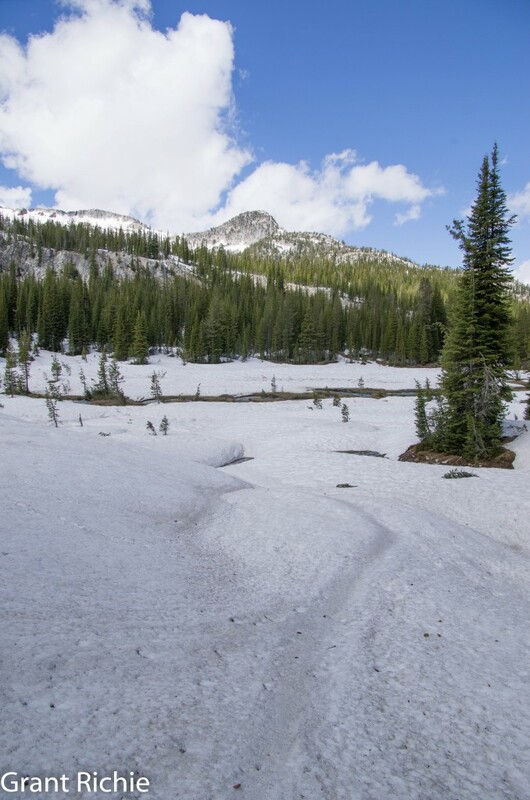 As the river flows out of the steeper, wooded canyon it opens up into a beautiful meadow and the snow disappeared. I wished I had someone with me to take some pictures of in this beautiful setting. Since I didn’t, I did the next best thing. I framed the picture on my tripod, switched my camera to “interval mode” where it takes a picture every 5 seconds or at whatever interval you tell it. Then I fished this beautiful high mountain stream. The water was moving at a fast pace and I did not rise any fish. They were probably hunkered down somewhere out of the current and I wasn’t too worried about not catching any fish here. Where I came down the mountain side was on river left, or the east side. I had not seen a trail for miles and did not worry about not seeing one now. I headed down the meadow assuming I would pick up the trail sooner or later. There was water running off everywhere and the meadow was like a marsh. Fairly quickly I came to the end of the meadow/marsh to a tree line. At this point the Minam River began to drop at a very steep rate. I had planned on using this trip not only as a fly fishing trip, but also as a reconnaissance trip for a future float. I had hopes of taking a packraft up to Minam Lake from Two Pan and floating the entire Minam River. At the tree line I began to walk up the meadow back and forth trying to find where the trail went into the woods. I did not find it, so I simply went where it looked best. I was trying to stay as close to the water as possible both in case I wanted to fish something that looked good, but also so that I would have a good idea of what a float trip would encounter. I quickly decided a float trip on this upper river was only for those who did not wish to live. The river was super steep, narrow, and had lots of wood. It was also in a granite gorge for much of the time with no possible way to eddy out or get off the river when you encountered wood. I began referring to this upper river as “The Gorge.” The granite walls kept pushing me further away from the river on this upper end and I could not stay close to it and keep hiking. I kept working my way down through the woods on river left and occasionally tried to work back to the river. Again and again I only found a chute of granite and was forced back up the hill to keep making progress. The very upper Minam still dropping with wood. I was not packing my Delorme GPS on this trip and at some point I decided to pull out my Eagle Cap Ranger District Map to try and figure out where the trail was supposed to be. At this point I realized that the trail actually crossed the Minam River before I came to it above the meadow. I never found the trail because it had crossed somewhere beneath the snow and I was now on the wrong side with an impassable gorge blocking me from the right side. I wasn’t too worried as the river would eventually have to mellow out a little and provide a good log jam or slow enough current that I could get across. In the meantime Molly and I were travelling through fairly dense timber with a lot of dead fallen logs and some of the ground pretty steep. I was a little worried about Molly’s pack getting caught on a snag and trapping her, so I watched her carefully to make sure she didn’t get stuck, but she did anyway. She lost her pack 3 times and became stuck to a log when she couldn’t slither out of her pack. Molly has followed me a lot of miles through some pretty hard places and she didn’t make a sound any of the times her pack got caught up. She will simply work until she gets free without whimpering. I was checking on her often so each time she slithered out of her pack, I usually only had to backtrack 20 to 50 feet before finding the log or branch her pack got snagged on. The one time she was stuck and couldn’t get free was on a steep downhill slide. She went over a log and her pack caught. Her body weight was already down the other side and it was steep enough that she couldn’t back up. All the other spots the pack caught, she was trying to get up and over a log and she was able to slither back down and out of her pack. I finally found a spot where the river was slow enough and shallow enough to let me wade it. Looking at the map now, it had to be in the vicinity of Little Pop Creek. I got out my waders and made it across the river. I had hoped the river was going to mellow out for some distance, but it quickly began dropping again. At this point I decided it was a good time to find the trail and cover ground. Molly and I began climbing up the hillside and we eventually came to a trail and began to follow it. The trail was way up the hillside though and not anywhere near the river. After following it for a while it also became really faint, narrow, and difficult to walk. Anytime you are on mountain trails there will be game trails that connect to the main trail. I had somehow missed the main trail that turned off and went downhill and I was now on a game trail high up the ridge with the river well below me. (As I am writing this I have hiked up the opposite direction since this trip and found where the main trail and the game trail diverged. The game trail looks just as used as the main trail and it is no surprise to me now that I missed the turn on my first trip.) Sidehilling on steep mountainsides with faint game trails is not a whole lot of fun when you are trying to cover ground and when I came to a good clearing I headed down the mountainside and found the main trail hundreds of feet in elevation below me. It was getting time to make camp. I was not real sure how far I had traveled since I hadn’t been on the trail most of the day and had been making slow progress through difficult terrain. The next morning I came to a washed out bridge and realized that I had camped next to the old Trail Creek crossing. That means I covered about 11 miles on the first day with a heavy pack through rough terrain and snow. Not a bad start. On my second day I was ready to try and fish a lot more. When I had envisioned this trip I had thought that I would do it like I do most of my trips. I would spend my day fishing the river and making progress. How far I made it during the day would determine how early in the day I would need to get on the trail and cover some miles. In this way I had hoped to not only fish the remaining few areas I had not yet fished, but also fish large sections of the Minam from the very upper end to the lower end to see how the fishing was in late spring and early summer. I quickly found it wasn’t going to work that way. The river was not getting any lower. Most places I tried to stop and fish . . . well they just weren’t that good. The river was too high. If I cast a fly out, it went ripping downstream past me before any fish had a chance to realize it was there. There was little break in the current and getting in the river and wading was a marginally bad idea. I could have done it by myself through sections, but I had Molly with me and I had to be careful of what she might get swept into downstream. At one point she fell off a log and was real close to being swept under the log. I had to grab her quickly. Anytime I felt like she might have any problems I kept her close so I could help her out if needed. Although there were sections where I could wade along the side of the river, it was deep enough that Molly would have to swim. If there is a bank, she will gladly follow along the bank, but the river was up into the brush and there was no bank. I fished as much as I could get to the river, but the water simply too high in most places. Early afternoon I gave up on trying to get to the water to fish and simply got on the trail and started walking. I had fished the river between Elk Creek and Rock Creek last year and was hoping that water levels might drop the next day and provide better fishing opportunities below Rock Creek. I walked well into the evening to make sure I got past Rock Creek and found an excellent meadow to make camp in. Molly and I covered about 9 miles on day two. I placed markers at the water’s edge near camp to see if the water level would rise or fall during the night. The next morning I couldn’t see much difference and I was beginning to realize that this was going to be a hiking trip and not a fishing trip. For the next couple days Molly and I eased our way down the Minam fishing when I could find a decent looking spot, enjoying the peace of the woods. The fishing was not good at high water and I would not recommend that anyone else fish the Minam at these flows. At high flows fish often hug the banks where the current is easier and there are often rocks, trees, limbs, bushes, etc. to break the current. I am sure there are plenty of ants that fall in the water near the edge and large stoneflies are migrating towards shore to hatch in the spring as well. It makes sense for fish to hug the banks for several reasons in the spring. On a larger river this can be excellent fishing from a raft since you can float down the middle and catch the fish that are hanging out at the banks. 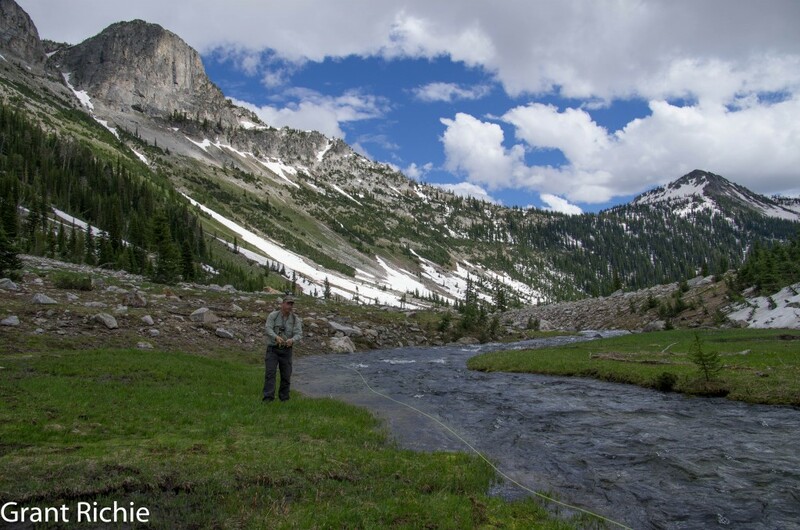 When you are hoping to wade a high mountain river, it means you can’t fish effectively. I got a lot of reading done and finished my book in just a couple of days. Anyone who has an interest in local histories and learning how a river came to be like it is should read “Into the Minam.” As Molly and I walked through the woods we often flushed out grouse with chicks. There was twice when the chicks flew so close to me I could have reached out and caught one easily. I tried to leave the grouse be so they could regroup and as I was walking away several times I was “chased” away by the hen at the same time. It was quite humorous really. I passed Red’s Horse Ranch on the fourth of July and saw the only other humans on my trip that day. There was a fresh 4 person trail crew who had started that very morning. They all looked pretty young and I asked how long they had been cleaning trails and I found out that they had just finished their training and were on their very first day of work cleaning trail. After hearing I had hiked down from Minam Lake they eagerly asked me how many trees were across the trail. 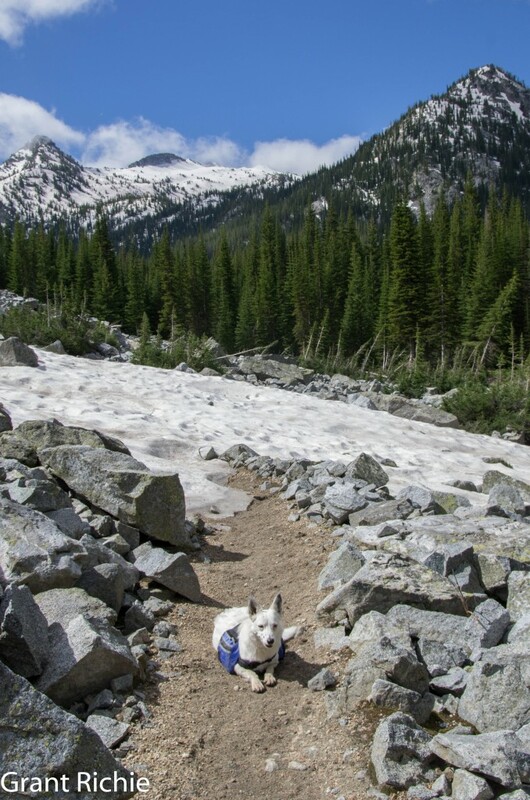 I told them not to worry, there was plenty of work for the summer and headed down the trail. In the book “Into the Minam” they talk about some very old ponderosa pine trees between Red’s Horse Ranch and the Little Minam River. On these old ponderosas are 150-200 year old scars from Nez Perce women. The women would weave baskets and to make them waterproof, they would peel the bark off ponderosas. The tree would then ooze a pitch like substance that could be used to waterproof the baskets. Small dense basalt rocks could be heated in a fire and dropped into these waterproof baskets to heat water and make food. Many of these old trees bearing the mark of the Nez Perce women are visible from the trail and I was glad I had read the book so I could appreciate their significance on the hike. By the time I was on the lower river I was really just hiking most of the time. I certainly stopped to fish if I saw a decent looking spot, but the river still hadn’t dropped much. On my fifth night I camped just below Trout Creek in the same location I had camped last summer when I hiked down Cougar Ridge. Upstream of this campsite is one of the best looking spots for fishing in the entire canyon. There is a large chunk of basalt hanging out over the river and a both good feeding water and very safe holding water below the large rock overhang. I of course had to fish this spot and was happy to rise a couple of smallish rainbows in the tail end. Working my way up I finally cast upstream of the overhang and let a large orange stimulator float back under the overhang. A broad back of a big rainbow surfaced several feet away and made a torpedo line for my fly. I only hooked him momentarily, but that was a big fish no matter what river you fish on. I tried many more times to entice the fish again without any luck. He was only going to be hooked once. On my 6th day I had less than 10 miles left to get to the store. Molly had finished off 8 days worth of dog food on the fourth night, so I had begun feeding her my food on day 5. With the river still high and Molly now eating my food supplies, I was ready to hike out. 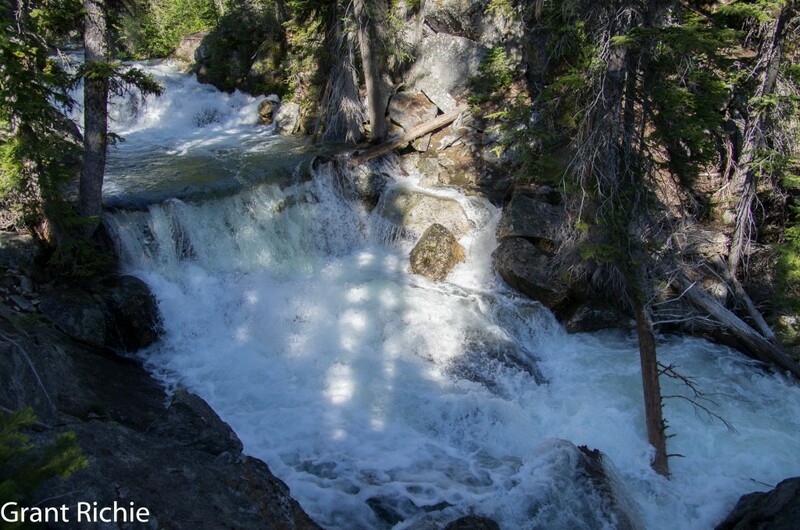 When you leave the Eagle Cap Wilderness area below Trout Creek the river enters timber company ground. 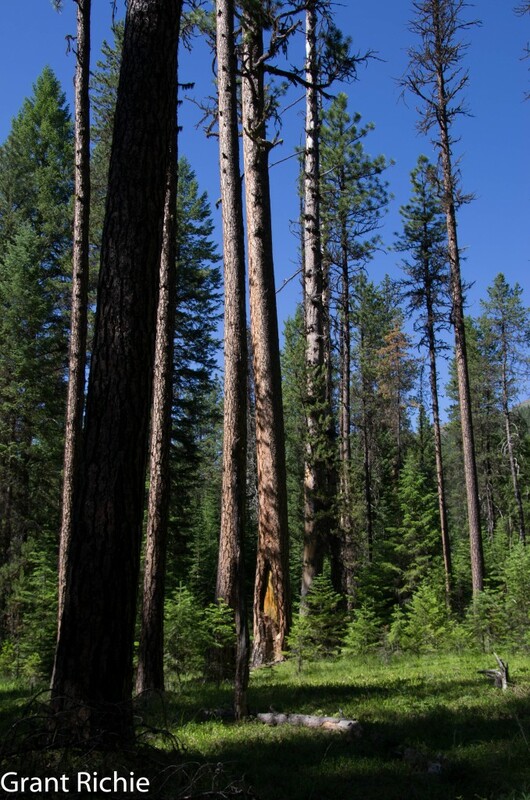 It was Boise Cascade ground, then it sold to Forest Capitol, and now this spring Hancock Timber Resource Group is the latest timber company to purchase it. The ground is open to non-motorized public access and as of this writing there has been no change in that policy with the change in ownership. At Meads Flat, below the wilderness area, the trail becomes a road on river right. From Meads Flat it is an easy 6.5 mile walk along the road until you get in the vicinity of Squaw Creek (2.5 miles upstream from the confluence with the Wallowa). Here the road ends and you can go through a barbwire gate to what looks like a ford with an old roadbed leading away from the river on the other side. This is not the “low water ford” mentioned in some hiking books. Backtracking to the wire gate I found a faint trail on the uphill or right side of the barbwire fence. After following it a hundred feet or so it becomes a well worn trail through the woods on river right. It is my understanding that the timber company ground changes to State fish and wildlife ground somewhere in here, perhaps at the wire gate but I am not entirely certain on that point. If you rely on your Eagle Cap Ranger District map you will find another error here where it shows the “Wildlife Flat” trailhead across the river from the mouth of Squaw Creek at the end of the road. The map is wrong on that point and you should continue downstream for 1.25 miles following the trail on river right through the woods until you are led back down to the river for the correct “low water ford” and the Wildlife Flat trailhead. The Wildlife Flat trailhead is 1.25 miles from the Wallowa and Minam Store. There is no bridge here and to get to the trailhead you must wade the river. It is called a low water ford, but the water was not low when I reached it. The river was running right at 1,000 cfs according to the USGS guage. I was a little nervous, but I thought it looked doable. I found a good stick to use as a wading staff and began to ease my way across. The river began to get strong, but wasn’t terribly deep. It got up to my waist or a little higher and I was getting more nervous about going for a swim. I was making it, but there was little room for error. Mid-river I errored and began swimming. It was a small error, my foot simply slipped on a large rock and could not get set on the river bottom. But that was it. I only went in as deep as my shoulders and managed to keep my hat dry. Quasi swimming with a pack in high water spring flows is not something I would recommend to anyone. It wasn’t terrible, but it was cold. I soon found footing out of the faster current and got the hell out of the water as quickly as I could. I was fine and there was no real danger of me getting swept too far downstream. The big danger was to my expensive camera. My camera is “weather sealed” but not water-proof. That means I can use it in the rain, but it will not take submersion. I have to hand it to Pentax here, because it handled it. My camera is still alive and well. My lens however got a fair amount of water inside of it. The water dried out but I now have water spots on the inside of the glass element and I will have to send it in to the repair shop. But at least neither one was ruined. Major lessons learned from this trip: the Minam River does not fish well above 1,000 cfs and should be considered unwadeable at those flows, in the years to come I will not even attempt a hike into the Minam until the flows are below 500 cfs. 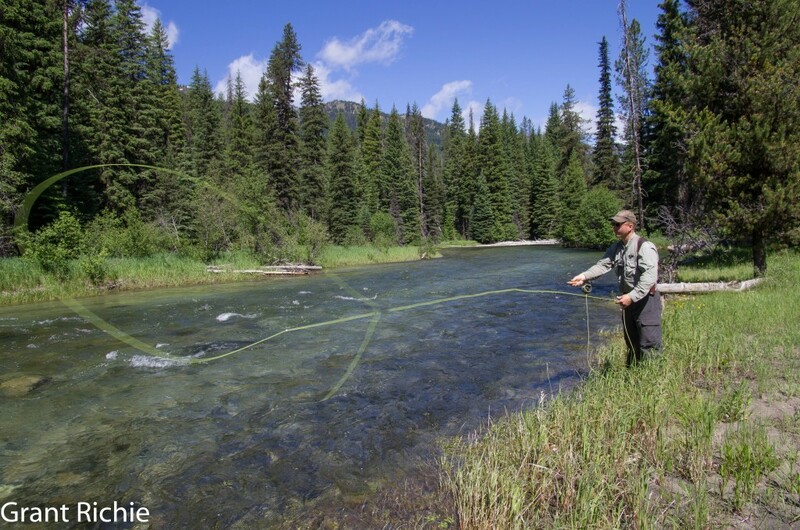 If I am looking to do a floating/fishing trip then I would settle with flows below 750 cfs. On the other hand, flying or horsepacking a 13 foot raft with light gear to Red’s Horse Ranch could be a fun way to fish the lower river in the 750-1500 cfs range and would allow you to fish to those bank hugging rainbows during the higher flows. I think I just made plans for a rafting/flyfishing trip for spring 2013. Wow Grant, what a great write up! Thanks Pat. I hope you have a good trip. I live in Hood River and am planning a quick pack trip up the Minam river next week 8/11 – 8/16. I get to combine two of my favorite things – flying and backpacking. I plan on flying into Minam Ranch and packing from there. I would like to get to Minam (and Blue) lake in hopes the fishing will be good in the lakes. Have you ever been back since this trip with no ice on the lakes? I’ve also fished the Minam in July with no luck. I’m hoping that mid August will allow for better fishing. Thanks for the info!! Do you think you’ll have the Minam Store Airstrip built by Saturday or Sunday If this all comes together I’ll let you know how it went but I’m thinking it must be kept a secret.